We "believe the Holy Scriptures of the Old and New Testaments to be the word of God and to contain all things necessary to salvation." The Bible is the source of our belief and moral standards. As God's Word written, to us the Bible is the lens through which we view and evaluate all other claims to truth. "Catholic" means "according to the whole. that which has been consistently believed and practiced from New Testament times. Our worship and life draw from the rich treasure of more than two thousand years of Christian experience. The Apostles' and Nicene Creeds, the ancient statements of the undivided Church, based on Apostolic and Biblical truth, are our statements of faith today. We have neither added to nor subtracted from them. The Book of Common Prayer (which enables us to active corporate rather than passive and private worship) contains the catholic treasury of worship and enables us to use it every time we gather for praise and prayer. The catholic balance of Sacrament and Word in our worship is evidenced by our regular celebration of Holy Eucharist and our emphasis on Ancient Faith and Biblical preaching. The rich inheritance of the liturgical year (Advent, Christmas, Epiphany, Lent, Easter, Pentecost), of centuries of sacred music, and solemn and festive ceremony are welcomed and encouraged in our Church. Worship in the Episcopal Church can be quiet and reverent and dignified. It can also call forth deep response during times of song, prayer, and even sermon. The Book of Common Prayer is the standard for our liturgy, and the vestments worn by our bishops, priests, and deacons date back to antiquity. These latter are the historical "uniforms" of Christ's servants. Our uniformity of worship, while allowing for variations, serves to remind us of the universal nature of the Church. In our worship we are united with past, present, and future generations of Christians. Our worship is carried out to the glory of God, and not for our entertainment. Episcopalians are not spectators but participants in worship. Not only do we express ourselves in word but also in gesture. Once upon a time it was said "we kneel to pray; we stand to praise; and we sit to be instructed." Because of the rich development in the history of liturgy, this is relaxed in order for people to engage evermore faithfully. Other devotional gestures (e.g., the sign of the Cross, bowing, genuflecting, etc.) are optional and personal. To Episcopalians, worship is not just the most important thing we do: it expresses who God made us to be: together, united, in prayer and praise and service to Him. Ultimately this reality characterizes all that we do in every area of our life. Much of our distinctiveness was hammered out in the English Reformation during the sixteenth century. Very different from the continental Reformation, the English Church had an ecclesiastical history vastly older than the rest of Europe from which she could draw. To be sure, there were Roman Catholic practices that the Anglicans protested. However, the word Protestant means "to witness for." The best of the Protestant beliefs was a witness that "God was in Christ reconciling the world to Himself." The Church had become legal and temporal and Anglicans sought to redress these things. However, the chief architects of these reforms were living in continental Europe and were engaged in differentiating themselves from the beliefs of the Roman Catholics rather than returning to the Ancient ways of the undivided Church. Anglicanism is most recognized for the genius of pursuing a Via Media which was ultimately neither Roman Catholic nor Protestant. The Middle Way is discerned through the application of Scripture, Tradition, and Reason. The Church has been established wherever its members have gone. The first Christian worship service held in North America was from the Book of Common Prayer, led by the chaplain of Sir Francis Drake's flagship in 1579 in what is now San Francisco Bay. The first church in the North American colonies was an Anglican one founded in Jamestown, Virginia, in 1607. The Lord Jesus Christ's call to go into all the world is taken seriously by us. Within this great Church we find such great and diverse servants of Jesus Christ as John Donne, John and Charles Wesley, William Wilberforce, Florence Nightingale, Evelyn Underhill, T. S. Eliot, Desmond Tutu, and Colin Powell. This is the church of more United States Presidents than any other. Among them are George Washington, James Madison, James Monroe, Franklin Roosevelt, Gerald Ford, and George Bush. Are you looking for a church that is clear about the Christian faith, that stands in the rich Tradition of the faith of the Apostles, that believes we ought to live so as to make a difference in the world? 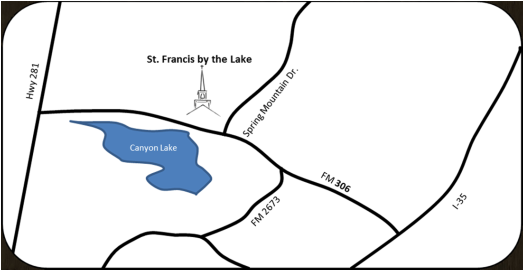 If you are looking for such a church, then St Francis by the Lake is for you. We welcome you and invite you into this faith and fellowship of Jesus Christ.